It seems age has no limit to these buckets either. At 6-8 months we would stack them up and they would crawl towards them and knock them down. They would laugh hilariously if we perched them on our or their heads. Some of the more creative uses we've found are, well my children for one particularly like the fabulously LOUD sound they make when you throw them against a hardwood floor. Also they like to "bounce" them down the steps of the stairs in a mad slinky-type experiment gone awry. All this people AND they are dishwasher safe! Could there BE a more perfect toy?! 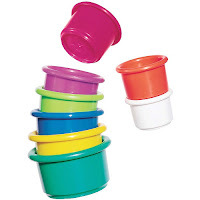 So next time you're shopping for a new baby, or toddler, don't be tempted with that tacky tickle me Elmo, or a modern battery operated rattle... Go get yourself the amazing Stack 'um buckets. You'll be GLAD you did. Ok, I love these buckets, too! I can play with the girls with these for hours. They make funny hats and they always bring a smile to them when they see one on my head.